The summer heat is in full swing, so we say goodbye to the snow peas. We had about 3/4 pound of them, and they were so tasty. Briefly, I felt like a successful gardener. Really, twelve ounces of snow peas is a big pile. They are our best harvest so far. The stray cats have also declared the end of snow peas in the garden to be tragic. They quite enjoyed spending time amongst them. Sometimes they best loved to nap under the snow peas' cool shade. Other times, they played jungle cat--hiding and then pouncing. I think we will plant more when cooler weather returns. No, not more stray cats, thankyouverymuch. Speaking of exciting gardening news, I have seen baby watermelons! We planted many more seeds this year in hopes of increasing our success. If you recall, one softball-sized watermelon is our current record. Bruce is very pleased to have found seeds for a variety he remembers fondly from years past called Sun and Moon. I will not even ask anyone to guess the song that runs through my head when I think of this type of watermelon. It is "The Only Time" by Nine Inch Nails. I think I might need a yellow shirt. The Tour de Fleece is almost here, and I have ideas. Some of it involves spindling. The wheels cannot follow me everywhere I might be next month. If all goes according to plan, there is a small Las Vegas adventure happening soon. One of the travel days might need some extra knitting, but I have not yet made any decisions. Probably it will not be this, though lately, I have had an inexplicable urge to knit it. Yeah, we have conditions in the nineties for temperature and humidity, and I feel the need to knit a stranded vest. As it has been a number of years since I last flew, I have been reading a little bit about how the rules have changed. No, I am not posting a question about bringing knitting needles on the Big Six, but I would like to be aware and prepare accordingly. Once again, the innerwebs have varied information--clearly, not all of it to be trusted. What I have determined, is that perhaps the quickest, easiest way to make it through security is to have a service monkey. Of course, I did read a lot of advice, and it is possible that some bad tips filtered through with the good. Maybe I did not get completely caught up, but I made progress. I weeded in the garden and the feedreader. Clearing out what needs to be gone from the garden is continual, but in some ways, easier. It is simpler to know what should be removed. The long list from the feedreader is a bit more of a challenge. This go around, I just removed those where the blogger has ceased blogging for a year or more. The next round will be more of a challenge, but it needs to be done because I cannot keep up with it all, and the weight of trying has taken its toll. I reflected and evaluated, and was sometimes surprised at what I discovered, but will wait to decide for another day, but not for too long. I suppose it just reminds me of another situation, and that is what is makes this more difficult than it might normally be. Anyway, I have been knitting, and the knitting has been good. I am nearing completion on another Hermione Hearts Ron. It is much further along than when I was taking photos last week. I need to finish it and get it in the mail this week, as we are reaching the end of another round over at Caps for a Cure. I also finished knitting a shawl, but more about that later. You can see it unblocked underneath this pile of love. Fabulous friends attending Estes Park Wool Market saw these amazing Pygora/Firestar batts and thought of me. The loving gift brought tears to my eyes and brightened a dark day. I get choked up thinking about it every time. The gardening is coming along. Not only did the lavender plant produce its first bloom, but kept growing enough so that I could make a lavender wand. I could not find ribbon, so I used crochet cotton to weave it instead. The wonderful fragrance has filled the living room as it has dried. After cutting the stems to make the first wand, the plant shot out some more, so I think I will be able to make another this week. Speaking of sweetness, Sara chose me for a Beautiful Blogger Award. I am humbled and speechless. Thank you, Sara. Now, I am supposed to list ten things about me that you do not know, but I am not going to because I cannot think of any. Instead, I will try to catch up on reading, commenting, and email. The name, Bitterroot, has always bothered me. 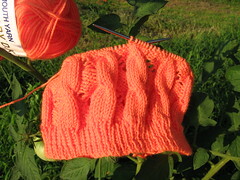 In fact, I almost would not knit it because of the name. Bitterness is such an unfortunate condition, and once it takes root it is even more difficult to remove. Still, it is such a pretty shawl, it did inspire me to reflect on the condition of my heart, and that is good. 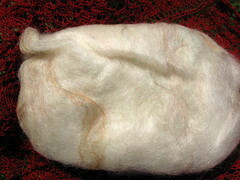 Also, it was an enjoyable knit, and the experience increased my confidence in my spinning. While I was a bit disappointed to run out of yarn, I was quite pleased to be able to spin more and have it match what I had done months ago. So, I am sure you are all wondering who will get this shawl. Well, since no one guessed that planting marigolds makes either, "All I Need is a Miracle" (just substitute marigold for miracle) by Mike + the Mechanics, or "Marigolds" by Glen Phillips play in my head, I needed to find someone else. Then, on Mother's Day, I was talking to my grandma, and when I described what I had been knitting, she asked that I not give it away before she can see it when she visits next month. Clearly, this means that the shawl should be for her. If I had known that it was going to be hers, I would have knit the smaller version, as she is tiny, and this shawl is huge. Still, it will keep her warm, and I am so excited to give it to her. Maybe I will learn to ply my trade more gently or artfully. I suppose those are all improvements I need to make, but for now, I am going to sit back and relax with my new dvd set, The Gentle Art of Plying. I will finally be doing something for the Tour de Fleece Training Camp. Yay, me! We will just pretend that my jumping was so joyous that I sprung right past the first. Of course, after a month where I rarely knew the day of the week, missing just one day seems like I am doing great. June is sure to be better. So far, my niece, Kaitlyn, has been released from PT, and all of the other therapists have given the green light for her to go to kindergarten this year. We could see she was ready, but I can tell my sister-in-law needed to hear it from them. Anyway, new month, new lace, right? It may or may not be the answer, but it is definitely a good idea. I am knitting another Swallowtail Shawl, and it is coming along nicely. Once again, this is not for me. This shawl will go to a friend I have recently reconnected with after many years. While seeing each other in person is not likely to happen anytime soon, it is still quite nice to be in touch again after all this time. The beginning of what we hope will be sourdough made its way to me this week. My sister has been raving about the bread that her co-worker bakes, so she pushed my name to the top of the starter waiting list. It requires another feeding before it is ready to go, but there are already claims on the first loaves. The weather people are predicting lots of random rain, thunder, and hot for this week. The good part is that it means we do not need to water the garden. However, it also means outside time does not always happen when I would like it, and I am still trying for a photo shoot for Bitterroot. I need to put out some food for the wandering cats, clean out my gills, and get out there and do my best at the next opportunity. Speaking of the garden, check out my first lavender bloom ever.